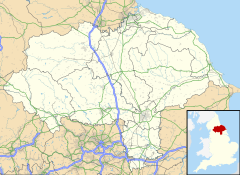 Boosbeck is a village in the borough of Redcar and Cleveland and the ceremonial county of North Yorkshire, England. The name is Viking in origin and means "the stream near a cow shed". ^ "CommuniGate | Boosbeck History". communigate.co.uk. Archived from the original on 13 April 2014. Retrieved 13 April 2014.